I’ve told you before about my tradition for anniversary gifts for my husband, where I get him something each year that matches the traditional year’s gift theme. (First year paper, second year cotton, etc…) That’s not such a unique idea, I realize, but I make it special by getting him a number of gifts equal to the number of years we’ve been married, which is way more fun! That meant that this year, for our 7th wedding anniversary, I needed to get him 7 of something that’s made of copper. This was not an easy gift to come up with, as you can imagine. What could I possibly get him SEVEN of that’s made of copper? Pennies wouldn’t be a good gift, and he’s certainly not into copper cookware, so I really had to put my thinking cap on to come up with something good. I finally decided to make him a set of copper wind chimes with 7 pipes. He loves sitting on the porch and I knew he would enjoy the sound. Perfect! To start, of course I needed to get some copper pipe. I headed to my local home improvement store and went to the plumbing section, where I quickly found a 10′ long piece of 1/2″ copper pipe. I had planned on cutting it into pieces myself at home with a copper pipe cutter, but when the nice lady working in that department offered to cut it for me for free, I took her up on it. I needed 7 pieces of pipe and wanted each one to be 2″ longer than the last, so she cut me pieces measuring 10″, 12″, 14″, 16″, 18″, 20″, and 22″ long. When I got them home, I drilled a small hole in the end of each pipe, making sure to drill all the way through the pipe so that the hole was on the back, too. Then I needed to get two wooden circles. The larger one would be the top, where the pipes would hang. The smaller one would be the clapper that would hang in the middle, keeping the pipes from constantly tangling. Make sure the smaller one is small enough to leave room for the pipes to hang down around it. My circles were about 8″ and 4″ across. Now for the tricky math part! Since I was going to use 7 pipes, I needed to mark 7 spots on the larger circle, equally spaced. An even number like 6 or 8 would’ve been easier, but with some trial and error, I finally got 7 spots marked. I drilled a hole about a half inch in from the edge at each mark. Then I drilled a hole in the middle of each circle (okay, my larger circle actually came with the center hole already in it). I also drilled three holes around the center hole in the larger wood circle. These would be used for the hanger later on. Whew, the geometry lesson is over for today, and it’s time to start putting this thing together! The pipes needed to hang from the wood by some sort of cord. I recommend using a nylon cord that’s suitable for outdoors. (Cotton will probably disintegrate too quickly when exposed to the weather.) Use something pretty thin and very flexible. I actually struck gold on this by using some mini-blind cords that I had saved from the last set of mini-blinds I threw away. It was perfect! I cut a piece of cord about 8″ long and threaded it through the holes at the end of one of my pipes. Then I took both ends, slipped them up through a hole in the large wooden circle, and tied them in a knot. I repeated this for the second pipe, but when I tied my knot, I held the wood up level and made sure that the string was the same length as the one on the first pipe. I did the same for all the remaining pipes, making sure to put them in order from shortest to longest. Next was the hanger. I took three more pieces of cord, tied a big knot in each, and fed them up through the three middle holes in the larger wooden circle. I held all three cords tightly in my hand (the pipes were pretty heavy!) and held the whole thing up in the air. Here is where balance becomes very important, as I needed to make each of the cords the exact length necessary for the wooden circle to remain level. The varying lengths of pipes make one side heavier than the other, but you can make it all hang level by carefully adjusting those three cords. When I had it just how I wanted it, I tied them in a knot and trimmed the ends. This part is ready to hang with an S-hook from a hook our porch ceiling. But first, I needed to add the clapper. I took one more piece of cord, tied a knot in the end, and fed it through the smaller wooden circle. Then I fed the other end up through the middle hole in the larger wooden circle, adjusted for length, and tied it in a knot. That’s it, the wind chimes are done! I hung them on the porch for my husband to see when he came home, and he loved them. See, wind chimes are really not very hard to make! You can make them out of just about any material you like, too. Copper not only suited my occasion, but it has a wonderful sound when the pipes hit in the breeze, so my husband and I were both very pleased with the results! Oh, one more thing… after doing all this, I realized that the spot I hung the wind chimes in wasn’t quite breezy enough to make them chime much, so I decided to add a wind catcher to help the breeze along. To do this, I just cut a little 2″ x 4″ piece of thin wood, drilled a hole in it, and strung more cord through the hole. Then I just fed the end up through the hole in the clapper and knotted it so the wind catcher hung in place. 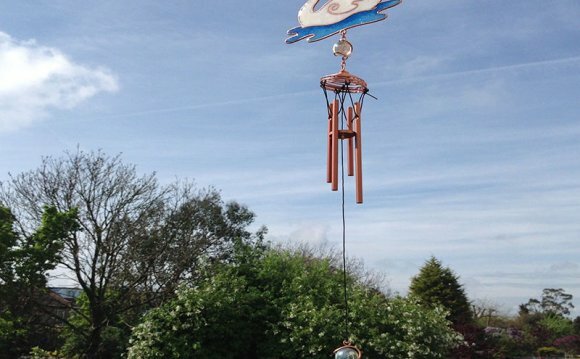 This additional wind catcher piece helps catch the breeze and make the chimes ring even more. So, keep this optional addition in mind if you want extra noisy wind chimes!